Spring break gives Chapel Hill a preview of the relatively student-free summer. A former family-owned home is undergoing construction at 208 N. Graham St. in Northside. 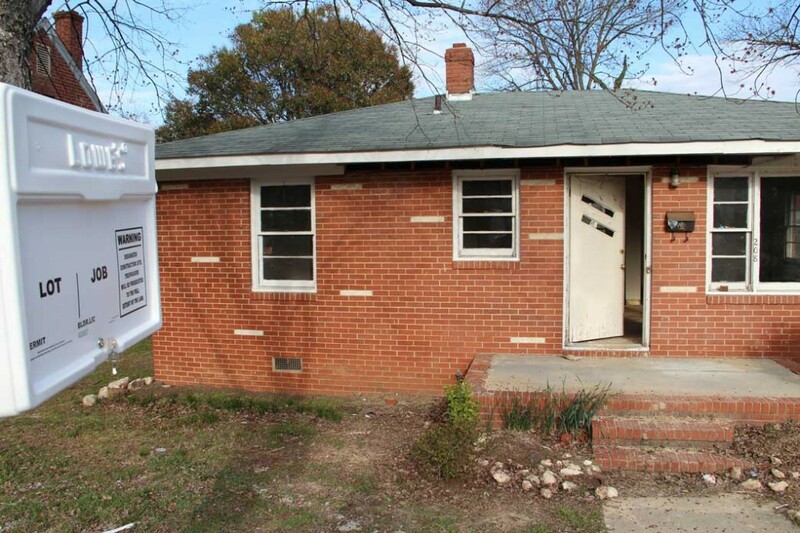 Lowe’s Companies, Inc. is one of the chain of retail home improvement hired by rental investors to renovate houses and rent them to students. Monica Palmeira, Managing Director at the Jackson Center, says: “Developers started to buy up properties to the point where a single developer can own up to 50 properties in the neighborhood.” (Staff photo by Faima Ramirez). Chapel Hill Magazine’s The WEEKLY asked neighbors if they liked it when students were away. Most people agreed that it is nice to have less traffic, more parking spaces and less noise, but that the town becomes too boring and businesses slow down when students are gone. Residents can’t live without students, but are they willing to live next door to them? A new apartment development hopes to address the demand for more off-campus student housing without disrupting the character of the historic neighborhoods in Chapel Hill. After a year and half of contentious public hearings and plan reviews, on Feb. 27 the Chapel Hill Town Council approved the Bicycle Apartments project, a student housing development that will be located at 602 Martin Luther King Jr. Blvd., and will offer 194 living units. According to the project proposal, the property will replace the existing underdeveloped, low-density apartments with a higher density project that will provide high-quality, sustainable student housing within walking distance of downtown and the University’s campus. Trinitas Ventures is the student housing development company behind the Bicycle Apartments. 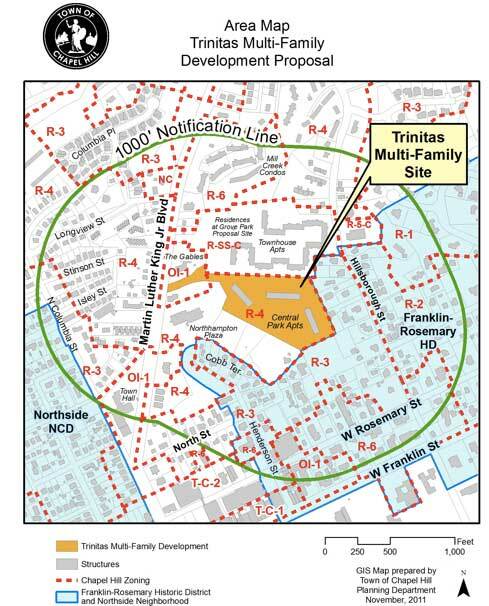 “The approval process in Chapel Hill was very much a stakeholder-driven process, where time was taken to look at the proposal, talk to neighbors, students and University staff,” said Travis Vencel, of Trinitas Ventures. Vencel first walked on the selected site in June 2009 after Trinitas identified Chapel Hill as a town that needed more intentional student housing. “We are providing specialized housing for the 18- to 26-year-old students,” Vencel said. “We know they like to live together and near the center of their universe, which is in this case the University campus and Franklin Street,” Vencel said. From that center, it doesn’t take long to reach Northside, the largest traditionally working-class, African-American neighborhood in Chapel Hill. Because of its proximity to downtown and comparatively cheaper rent prices, Northside has long been a popular choice for students who want to live off campus. Monica Palmeira, managing director at the Marian Cheek Jackson Center, the public history and community development center located at the gateway to the historic Northside of Chapel Hill at 510 W. Rosemary St., said that students have always been a huge part of the Northside neighborhood. However, in the last 10 years there has been a rapid changeover from family-owned properties to student rental units. “Northside traditionally used to have very cheap properties compared to the rest of Chapel Hill, so developers started to buy up properties to rent them to students,” Palmeira said. In 2011, the Jackson Center’s Sustaining OurSelves Coalition teamed up with the Counter-Cartographies Collective to map property owners in Northside to determine which homes were investors’ and which were homeowners’. They found that since 2000 the number of investor-owned properties has nearly tripled. Because the rate of profit is so high, more and more outside investors and developers want to get into the market. Palmeira explained that some properties have been renovated to have six, seven or eight bedrooms renting at $500 per month each. That puts the minimum rent total at $3,000. Palmeira emphasizes that students are not the problem. The problem is that the town’s occupancy rules have been difficult to enforce. Officially, homes that are classified as single-family or two-family units that are rented or occupied by more than four unrelated persons are in violation of the Town of Chapel Hill Land Use Management Ordinance. According to the Chapel Hill Town’s website, it wasn’t until January 2011 that the town started to actively enforce over-occupancy issues in rental housing throughout Chapel Hill. Loryn Clark, interim assistant planning director of the Town of Chapel Hill, said that over the last couple of years the town has refined its zoning regulations reviews to include family homes in Northside and Pine Knolls. “We now try through new regulations — like lower maximum size and height requirements — to reframe developments so they are more in line with the traditional character of the neighborhoods,” Clark said. Keith Edwards, a Northside resident since the 1960s, has been very vocal about the pressure that student rentals pose on the neighborhood. Most neighbors complain about noise levels, large quantities of lawn trash and an average of four cars parked in every front yard. “When you live next to a eight-bedroom house that is having parties every weekend, quality of life is not as great anymore, and Chapel Hill doesn’t feel as welcoming to families as Durham or Mebane,” Palmeira said. Historically, Northside has been a blue-collar neighborhood, comprised of people who have worked for the hospital, town, University and schools. Now, most of the remaining residents are older retired folks whose children have already moved away. Vencel, of Trinitas Ventures, said that some of the main concerns that neighbors have raised at public discussions about the Bicycle Apartments were related to noise levels and increased traffic. The Bicycle Apartments, which offer 608 bedrooms, include only 241 parking spots. He also emphasized that the 275 bicycle parking spots are meant to encourage the sustainable community that the Bicycle Apartments want to promote. In the light of a third prominent restaurant closing on Franklin Street in as little as three weeks, this may be a legitimate argument. Kildare’s Irish Pub joined Pepper’s Pizza and 501 Diner when it closed its doors on Thursday, March 14. In addition, Phil Mason, principal planner of the Town of Chapel Hill, said that some of the neighbors were concerned about the visual impact that the proposed development would have on the adjacent Franklin-Rosemary Historic District. Area map that shows where the $22-million Trinitas Ventures project will be built in May-June. The Bicycle Apartments, a student housing development that will be located at 602 Martin Luther King Jr. Blvd., will offer 194 living units. The apartment complex is adjacent to the Franklin-Rosemary Historic District, which caused lengthy and contentious public hearings over a year and a half period. (Photo courtesy of the Town of Chapel Hill Development Activity Report). In response to these concerns, Trinitas redesigned the building to be only four floors tall next to the historic district. On the west end of the complex, the building will be six stories high. Another point of contention about the project is the amount that the $22 million-development is donating to the town’s Affordable Housing Fund. Clark explained that organizations, such as the Community Home Trust, can apply for funding on behalf of residents who need home ownership or renovation assistance. Trinitas Ventures has given $120,000 to the fund. Clark says that Chapel Hill has started to consider a baseline amount that developers have to assign to affordable housing. Vencel argues that the measure has to be carefully crafted or it may discourage developers from coming to Chapel Hill. Besides its proximity to campus and downtown, the development hopes to attract students with an array of services such as a fitness center, a pool and a clubhouse. Rent prices will range from $500 to $800 per month per person depending on the apartment’s number of bedrooms. This includes furniture, Internet access and all utilities except electricity. While excitement may be stirring around campus over the Bicycle Apartments, residents of the Northside neighborhood say that the development will not solve the issue of increased pressure on their communities. Loryn Clark said that she doesn’t believe that the development will pull students out of the historic neighborhoods, but that it may help alleviate the pressure in the future. The project is undergoing the last zoning review by the Town Council, and construction will most likely begin in May or June of this year. During the 16-month construction period an average of 120 jobs will be created. However, Vencel said that Trinitas Ventures does not have a requirement for their subcontractors to hire locals, another point of contention. Palmeira and members of the Northside community say that, despite all the concerns regarding the Bicycle Apartments development, they are hopeful that it will be another tool to preserve the historic neighborhoods in Chapel Hill and Carrboro. Faima is a Carrboro Commons staff writer.